Manchester United boss Sir Alex Ferguson has revealed his pride after his side set a new Premier League record of 11 successive clean sheets. The league leaders eclipsed Chelsea's previous tally in the 5-0 win against West Brom at The Hawthorns. He said: "I am proud of them. They have been fantastic in this run. 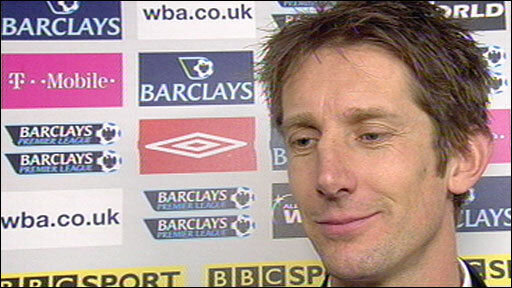 "Edwin van der Sar has had a fantastic career but he was really pleased to get this record. You look at him and what happened has really thrilled him." 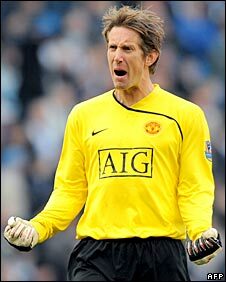 After Van der Sar kept West Brom at bay for 84 minutes he broke Chelsea keeper Petr Cech's Premier League record of 1,025 minutes without conceding a goal. The Dutch keeper, who collected the match ball, said: "The most important thing is the win, but of course it is great for the team to get the record. I just needed to keep the concentration levels high and fire up the defenders and midfielders. "We are delighted with the record because we haven't even had a settled defence, with players injured and others coming in and out." Van der Sar and Nemanja Vidic have been the only ever-presents in defence over the 11-game run, although they will lose the Serbian to suspension next month. United expect to discover on Friday what punishment Vidic will face for his sending-off in the Club World Cup final victory over LDU Quito in Japan. He could get either a one or three-game European ban as Fifa have handed the matter over to Uefa, with United scheduled to face Jose Mourinho's Inter Milan in the last 16 of the Champions League. But domestically Ferguson was pleased his side took the opportunity to improve their goal difference by thrashing a West Brom side who were reduced to 10 men five minutes before half-time by the sending-off of defender Paul Robinson for a foul on Ji-Sung Park. Ferguson said: "The scoreline was important. We showed a ruthless streak about us, possibly for the first time this season. "It has been a long time coming and we needed it because I think goal difference could play a part. It is a satisfying result in that respect." West Brom boss Tony Mowbray refused to be drawn into referee Rob Styles' decision to send off Robinson. He said: "Managers tend to get into trouble if they talk about officials. You can tell by the stadium noise what everybody thought of the referee's performance, but I'm sure he thought he did okay. "These aren't the games that will define our season. We hope to give a good account of ourselves, but games against United, Chelsea, Arsenal and Liverpool are not the games that are going to keep us in the Premier League. "We have got a couple of games coming up that are much more defining ones and we will focus on them."